A mostly Scotch Bonnet based harvest this afternoon. After a stint working in the Commonwealth of Domimnica in the Caribbean I became addicted to hot sauce. It was on the table in all the restaurants there and seemed to be a staple for the locals. The top brand was Bello. I took supplies home that soon ran out. A friend shipped me some which ran out too. I was sauceless and craving. Poultry and fish just weren’t the same. I decided something needed to be done. I needed to make my own. I started scanning ebay for people selling seeds. Sure enough I found numerous sellers with some super hot chillis. I ordered quite a few different types. These were planted and my chilli growing began. When I do things I like to do them properly. Some may say obsession. My long suffering wife wasn’t surprised to find sixty chilli plants in the yard comprising of 11 different strains. Heat in chillis is measured in Scoville units. 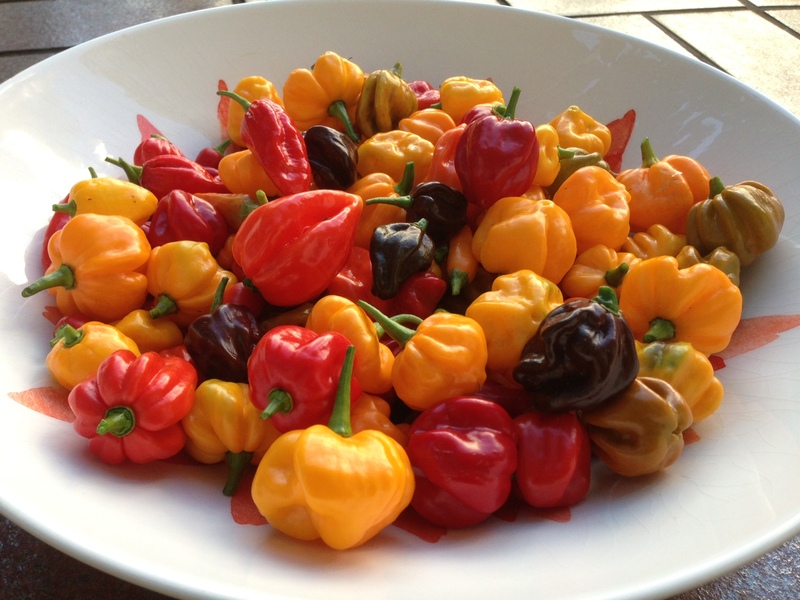 The Trinidad Scorpion(Butch T) is the current world record holder for the hottest chilli on earth. A jalapeno comes in about 10,000 Scoville units. 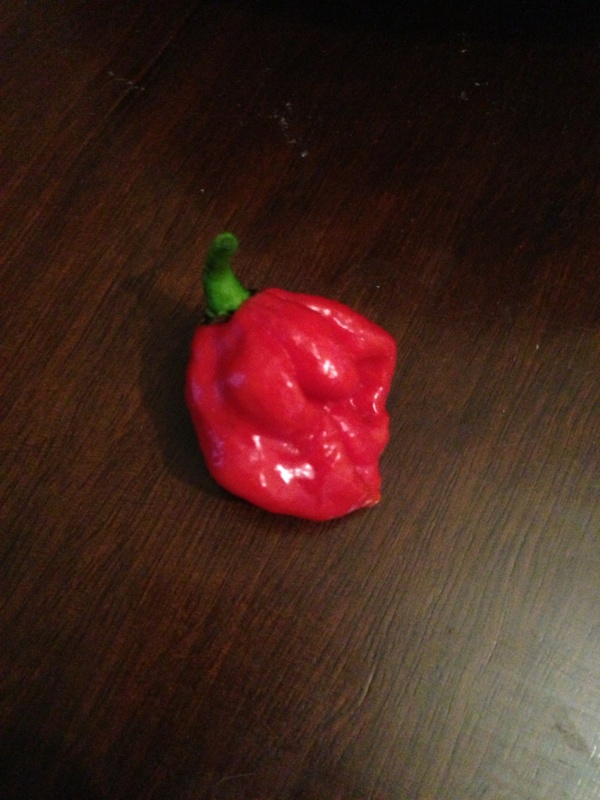 Compare this to the Trinidad Scorpion(Butch T) at 1,463,700 Scoville units!!! Chillis are fairly easy to grow. I used a quality potting mix. Fertiliser such as dynamic lifter, slow release pellets and seasol worked well. Apparently they don’t like too much nitrogen when flowering. I found out to get really hot chillis you need to use worm juice. I raided the neighbours worm farm when they were on holiday. A fair payment for looking after it I thought. Chillis do like water but I was told not to give them too much as it reduces heat. As far as sun goes the blazing Australian summer sun seemed too much for them. I changed them to a spot with dappled sunlight under a tree. They seemed much happier.They have been fruiting all through summer. I’m amazed at how many I have harvested. I just picked another heap this afternoon. Two four litre ice cream containers. I have made litres and litres of beautiful ultra hot Caribbean hot sauce now. I’ll put the recipe up on here soon. We also freeze plenty for use through the year. Salsas with the fruity strains of chillis are amazing. Give the chillis a go. They are an addictive plant to grow, compliment dishes well (I’d have em on corn flakes) and provide beautiful varied colours for the garden and plate. The Red Habanero. A great producer of big hot pods. 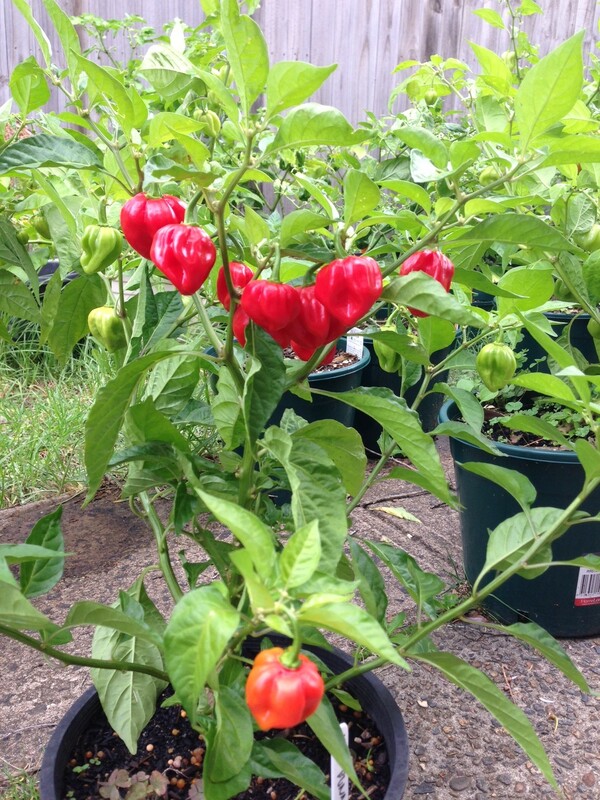 This entry was posted on April 23, 2013 by gourmetandy in Growing and gathering and tagged bhut, bonnet, butch t, Caribbean, chilli, Commonwealth, Dominica, fatali, gardening, growing, habanero, hot, jolokia, pepper, pod, pods, sauce, scorpion, scotch, scoville, seeds, trinidad, yellow 7.